After returning from a trip to Prince Edward Island the first-cut hay needed to be made and the focus of this blog became preoccupied with that process. Now that the hay is in I can turn once again to island images which now occupy the queue that formed soon after our return from Canada. In the text which accompanied the P.E.I. post linked above I mentioned that potatoes were the island’s primary crop and that a great variety of other crops thrive there as well. I cannot now remember what was growing in the field below but if I had to guess, I’d say it was corn. I like the way this image boldly presents its limited palette of color. Traveling P.E.I.’s Confederation Trail by tandem bicycle was a fascination in so many ways. Looking again at this image reminded me that I had been amazed at how the environmental landscape changed so dramatically over very short distances. In the island’s interior we pedaled past both shrub swamps and swamp forests, bogs, mesic woods, and the transitions between all of these. Along the island’s perimeter we enjoyed estuaries, mud flats, and both soft-bottomed and rocky coasts. The underlying sandstone aquifer provided such ample supplies of freshwater that artesian wells punctuated the trail with some regularity. Having never been to P.E.I. 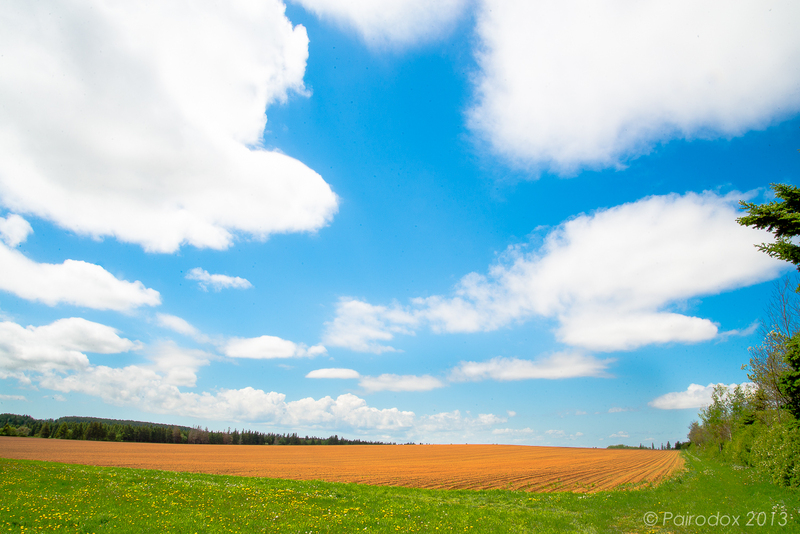 and only knowing the picture of it which had formed in my mind’s eye from watching the Anne of Green Gables series I was surprised to discover that much of its interior is occupied by large expanses of cultivated ground, the sort of which you see below. You may click the image for a somewhat larger view. I believe that skylines, cityscapes, highrises and malls symbolize civilization to many people – and so be it. The P.E.I. landscapes I experienced were like paintings to me; simple, open, uncluttered, clean, and alive. That’s my kind of civilization and I like it just fine.